ChondroPower 3000® is a chondroprotective unique formula that helps reduce cartilage degeneration and promote normal healthy joints by increasing the synthesis of synovial fluids to enhance athletic horse’s performance. It is known that the athletic and overall performance of a horse is directly related to the animal’s mobility and how well its joints function. Exercise, among other factors, is necessary to strengthen your horse, but training and competition exert tremendous strain that affects the joint cartilage. ChondroPower 3000® is an effective oral joint supplement that contains Chondroitin sulfate (70% A and 30% C), which is a major structural component of cartilage. 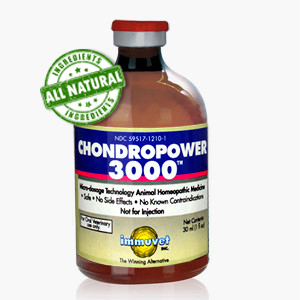 Give your horse 30ml (1 bottle) of ChondroPower 3000® on an empty stomach once a week.